by Joe Movie Review	• Tags: A Night at the Garden, Black Sheep, End Game, Lifeboat, Period. End of Sentence. Synopsis: Following the killing in 2000 of a 10-year-old boy of Nigerian descent, Cornelius Walker’s Nigerian mother, fearing that her sons could also be targeted, moves her family from London to Essex. Their housing estate is filled with racists, however, prompting Cornelius to go to extremes to fit in and find friendship. Review: This documentary boasts a strong central subject in Cornelius Walker and benefits greatly whenever he’s onscreen relaying his story of moving to a suburb of London and the racism he encountered as a teenager. How he adapted is startling, challenging, and not in any way you might expect. Yet I was left mighty conflicted with this one because so much of it comes in the form of dramatic reenactments. I guess I’m more used to documentaries featuring more substantive footage than just a taped interview spliced together with (well-made) re-created sequences. Director Ed Perkins nicely weaves the real Walker in with his cinematic younger self at times but I kept wanting the picture to grab me more than it did. Synopsis: At Zen Hospice Project in San Francisco, teams of medical professionals, social workers and counselors work with patients and their families to ensure that their end-of-life care is compassionately tailored to their needs while also trying to alleviate their fears about death. Review: Available on Netflix, End Game is a tough watch in that it deals with the stark reality of death in very frank terms. Following a palliative care team at a California hospital as well as taking us inside a hospice, directors Rob Epstein and Jeffrey Friedman approach their subjects with compassion and care but don’t candy coat the proceedings. As someone who has had a parent go through a hospice experience, I would have preferred perhaps a bit more emphasis on that side of things because while we are introduced to the care teams there isn’t time to dig deeper than the surface explanations as to how they came to do what they do. It takes a special soul to do this work and hearing more about what brought them there would be comforting as well. Synopsis: In 2016, the German nonprofit Sea-Watch aids refugees braving the dangerous crossing of the Mediterranean Sea from Libya to Europe. One such rescue mission, piloted by British captain Jon Castle, plucks refugees from several tiny boats and carries them to safety. During the journey, the refugees reveal how poverty, violence and sexual trafficking forced them to flee their homes. Review: I feel like every year there is a documentary about immigration and the rescue attempts by foreign countries that step in and provide care for refugees that are fleeing their country. This year that nominee is Lifeboat and unfortunately, there isn’t much being said here that hasn’t been captured in similar films in the recent past. Once again, the short running length doesn’t give audiences a chance to get their bearings with the crew, much less the rescued people, before the credits are rolling. Aside from Jon Castle, a reasonably appealing grizzled sea captain, everyone sort of blends together and become footnotes in their own story. Synopsis: On February 20, 1939, more than 20,000 Americans gathered in Madison Square Garden to celebrate the rise of Nazism. Archival footage shows the speech given by Fritz Kuhn, the leader of the German American Bund, as he urges his supporters to mistrust the media and free America from the influence of Jews. Review: At seven minutes long, this is the shortest documentary nominee I’ve seen and one of the strangest. Featuring never before seen footage of a Nazi gathering at Madison Square Garden in 1939 before Hitler’s rise, there’s no context given or much in the way of directing your attention. It plays like newsreel footage that is missing narration and, while it carries a passing curiosity as an anecdote for Madison Square Garden or a pre-World War II era scholar, it doesn’t do much to raise the interest of a casual viewer. Synopsis: In the rural village of Hapur, outside of Delhi, India, women hope to make feminine hygiene supplies easily available and end the stigma surrounding menstruation, which often results in girls having to drop out of school. A machine that makes sanitary pads is installed, and the women operating it find financial security and independence. Review: Ending on a strong-ish note, the least somber of the documentary shorts is certainly Period. End of Sentence. which follows a tiny village in India that receives a machine that can make sanitary pads. Operated by the women of the village who can then sell the pads, there’s an energy to this entry that felt strangely absent from the other nominees. Helping to liberate young girls and women from the stigma of negotiating their monthly cycle within a community that isn’t equipped to address it, the machine represents a newfound freedom that inspires many. A definite crowd-pleaser, it may not be the most technically well-made of the bunch but for me it was the most memorable. Also, this one feels like it could eventually be turned into a narrative feature film — the story is strong enough to support it. 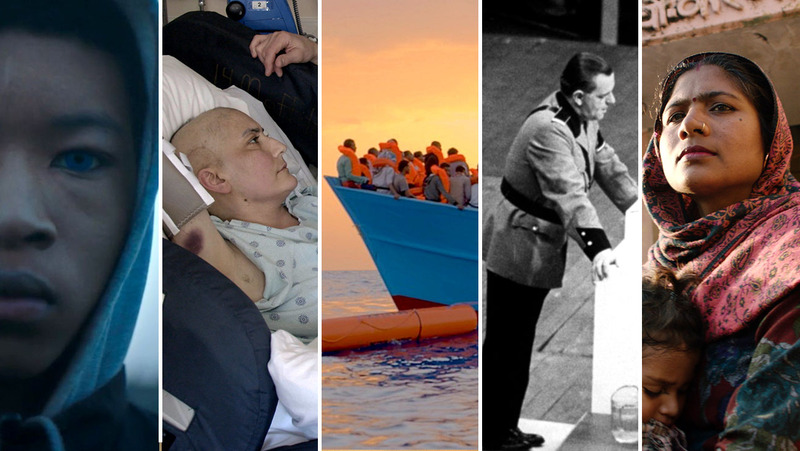 Final Thoughts: Usually, the documentary shorts is the one category I can rely on to be strong. In past years I’ve had positive responses to most, if not all of the nominees, and can easily see why they made the cut. This year, I was pretty disappointed in the selections and while I can understand how their topics would have elevated them to the visibility of the Academy and its voting body, I didn’t find any of them to be outright Oscar winners. So it’s hard to tell which film might wind up taking the award. I could see voters responding to the conflict within Black Sheep and rewarding the filmmaking style, but it feels more like a feature film than a documentary. Period. End of Sentence. will likely be the easiest to digest which could be good news for that entry but might A Night at the Garden take the prize because of its sheer simplicity? Even though the category is overall disappointing, this is a tough call.